Mr Jérôme Ferrier, IGU President, welcomes participants at the NGV Transportation Village inauguration. WGC 2015 in Paris has drawn to a close. While there has been much high level discussion about gas supply, investment, exploration, policy and pricing in the meeting halls and on the exhibition floor, the busiest sector in the pavilion has been the Natural Gas for Transportation Village – a first for the World Gas Congress and now a successful template for future WGC events. 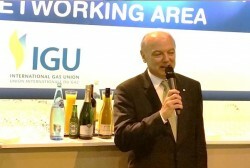 The Village inauguration ceremony was addressed by the President of the International Gas Union (IGU), Mr Jérôme Ferrier, who welcomed participants and spoke of the rapidly increasing recognition and demand for natural gas as a cleaner, economic fuel, and his desire for NGV industry companies to succeed at WGC 2015. “The focus of our event will be to draw together all stakeholders in this fuel evolution, increase awareness of a rapidly evolving industry, and plan for a sustainable energy future that is safe, reliable and economically viable. I am confident that by collaborating with industry leaders such as NGV Global and their peers, we are moving ever closer to real solutions that will consolidate the essential role that gas has to play in tomorrow’s world,” Mr. Ferrier concluded. In March last year, WGCPARIS2015 Executive Director, Mr Daniel Paccoud and NGV Global Executive Director, Mr Diego Goldin, said that the objective of the NGV Village was to profile the rapidly growing ‘natural gas as transportation fuel’ sector, within the world’s major natural gas event. That has been achieved. Fifty exhibitors located their stands in the village precinct, including NGV Global sponsor Galileo Technologies with their modular equipment for both CNG and LNG production, and Clean Energy Fuels Corporation, the latter represented by Clean Energy Compression (formerly IMW Industries) with their complete CNG systems. NGV Global’s stand was busy throughout the 3 days of exhibition at WGCPARIS 2015. Many more natural gas for transportation companies, including NGV Global sponsors Emerson Process Management, cylinder manufacturers and technology and equipment providers spread the word cross the floor that natural gas is a viable, technology-ready high-performance fuel for land and marine transportation and a downstream industry that has come of age. NGV Global welcomes new members JC Carter (LG nozzle technology) and Oasis Engineering (CNG/NGV precision technology) who signed up in Paris, and is appreciative of the multiple inquiries from prospective sponsors and members. NGV Global was joined at WGC 2015 by affiliated association NGVA Europe, our co-host for the NGV Village and primary mover in bringing to the Village international OEMs Mercedes-Benz (sponsor of the NGV Village seminar stage), Iveco (a division of CNH Industrial) and Renault Trucks (sponsor of the NGV Village seminar program). Their on-display vehicles added a new dimension to the WGC exhibition. The NGV Village networking area, featuring Blue Corridor vehicles, was a popular meeting place. Furthermore, the presence of multiple vehicles from the Gazprom-EON sponsored Blue Corridor Rally 2015, participating in a 6800 km natural gas fuelled round-trip from St Petersburg, rounded out the display to include light duty vehicles and buses. NGV Global was privileged to be approached by representatives of several countries investigating or making early moves toward adopting natural gas fuel in their countries. The depth of experience available from our members and associate members (via affiliated organisations) provides important guidance, knowledge and contacts, saving valuable time and facilitating purposeful investment. Dr. Manfred Schuckert, Head of Global Regulatory Strategy – Commercial Vehicles, Daimler speaks to a capacity audience at the NGV Village. The seminar program was exceptionally well attended, with many sessions full to standing room only. Free-to-attend presentations generated valuable discussion and network opportunities, while attracting trade visitors to the Village precinct. Feedback received by NGV Global from stand holders was that the level of trade inquiry was higher than anticipated and was more-than enough to justify their presence at this inaugural Village exhibition. Indeed, one stand-holder informed us that “the level of trade inquiry and networking far exceeded that of the last two exhibitions we participated in”. Finally, much discussion was had with mid-stream industry providers now recognising the growth opportunities represented by natural gas as a transportation fuel, including fuel transportation, dispensing, technology provision and more. The many areas of synergy between land and marine based refuelling and gas storage technology was also a feature of discussion. NGV Global held a Board Meeting in Paris, participated in political and technical fora and meetings with NGVA Europe and other organisations, and furthered its preparation toward a successful NGV Global 2016 event – look out for updates on that soon. NGV Global acknowledges the support of the International Gas Union in making the NGV Village possible and the work of the IGU planning committees and Exhibitions and Trade Fairs (ETF) toward making it a reality. We also thank the French Gas Association for providing space for our meetings. Without doubt, a successful event!